Click the logo above to view the original article on IFLSscience! A volcano is a lava-filled boil on the surface of the Earth, just waiting to build up enough pressure to spew out ash and lava. A nuclear bomb is an explosive, man-made weapon designed for destruction and chaos. It disintegrates everything in its local vicinity and irradiates everything in its range after that. But what happens when you combine one of man’s most destructive creations with one of nature’s? Uh… nothing actually. This is a nit-picking technicality, but dropping a bomb (even a nuclear bomb) into a bubbling cauldron of magma would be very anticlimactic. The bomb would melt without starting a nuclear reaction. A nuclear bomb is made of explosives and a radioactive core (for example, plutonium). To ignite a devastating explosion, the explosives all need to detonate under careful timing to create enough energy to start a nuclear reaction in the core. Once the chain reaction starts, there’s no stopping it. However, if a nuclear bomb was plonked into a chamber of magma, it would melt – shell, radioactive core and all. 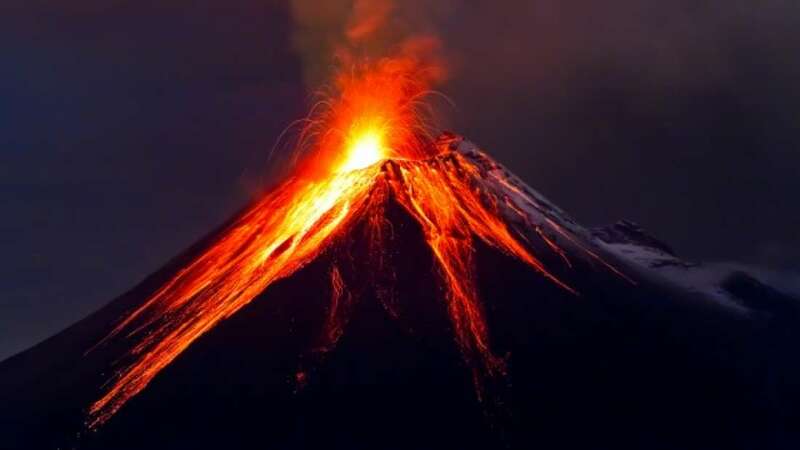 In order to start this essential reaction, and create a catastrophic explosion, the bomb would need to be detonated above the volcano mouth, or magically transported into the magma chamber’s center. Example of a stratovolcano. 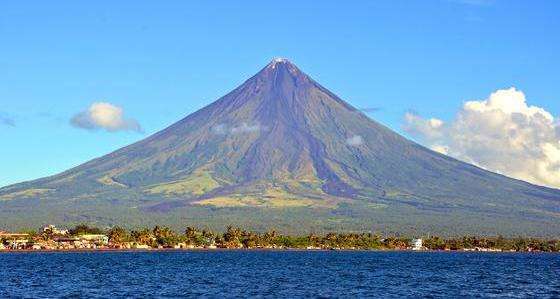 Mayon Volcano in Legazpi, Philippines. suronin/Shutterstock. The less explosive of these two options is detonating the nuke above the mouth of the volcano. If the volcano is a stratovolcano (like a cone), then the nuclear bomb might do a little cosmetic surgery on the tip of the volcano, but probably wouldn’t ignite an eruption. The blast radius of the bomb is too small to reach the pressurized chamber of magma that sets off an explosion. The bomb, on its own, would produce a fireball that would incinerate everything in its near vicinity. It is also responsible for forming the signature mushroom cloud. Further away from this, there would be a high-pressure air blast that would knock down concrete buildings. Flooding out further than this is the radiation, and anyone at this range would suffer a lethal dose of radiation. Even further out still is the thermal radiation, where people suffer third degree burns (which extend through the layers of the skin). Fat Man – the bomb that was infamously launched into Nagasaki during WWII – has a fireball radius of 200 meters (660 feet). Compare this to a volcano of moderate height, Mount St. Helens, for example, which is 2,550meters (8,370 feet) after its last eruption. Fat Man would only create a chip in the top of this volcano. The Tsar Bomba – the largest bomb ever tested by Russia – would have a much bigger structural effect. This nuclear bomb had a fireball radius of 3,000 meters (10,000 feet) and would significantly reduce the height of Mount St. Helens. There could be an eruption if magma is already in the vent, near the mouth of the volcano, and only needs a small amount of pressure to trigger an eruption. But the real destruction happens when the bomb is suddenly transported into the magma chamber, between one to 10 kilometers (0.6 to 6.2 miles) underground. The bomb would be hot enough to vaporize the magma and rock within the chamber after it’s all been irradiated. The magma is in a semi-solid, semi-liquid state, but the initial flash from the bomb would boil this quickly. The bomb would shower the local magma, rock and dirt with radioactive particles while a tremendous amount of pressure is being created in the chamber very quickly. There’s only one place for this magma, rock and pressure to go: Out. Some of the erupting material will be lava, but that isn’t the dangerous bit. The deadliness comes from the plumes of ash. For example, the Icelandic volcano Eyjafjallajökull virtually brought global air travel to a standstill with plumes of fine dust. In this case, the dust traveled all the way to Italy, Russia and towards the East Coast of America. In our nuclear bomb example, this dust would also be radioactive. And the power of the chain reaction in the bomb would push more ash into the environment for a longer period of time, causing long-term contamination hazards. But what would happen if Tsar Bomba was set off in the chamber of the world’s most famous supervolcano: the Yellowstone supervolcano? This supervolcano has no conical mountain over it signaling its existence. Instead, it’s an enormous bubble of magma below the surface of the park. The eruptive power of this volcano would dwarf the explosive power of the bomb. The bomb would set off a supervolcano eruption with no problem, but equally just drilling into the chamber would do the trick. Andrews postulated to IFLScience about the global catastrophe that would follow the detonation of a nuclear bomb in Yellowstone. “If you buried [a nuke] in Yellowstone, deep enough and it was powerful enough to crack that magma chamber open … you’ll just cause an extinction event. That’s when the nuke wouldn’t be the problem,” commented Andrews. The ruinous power of the volcano would dominate the comparatively puny power of the bomb. The lava from this supervolcanic eruption would likely be contained within the confines of the park, however the lava isn’t humanity’s biggest problem. It’s the dust that is blown into the atmosphere. 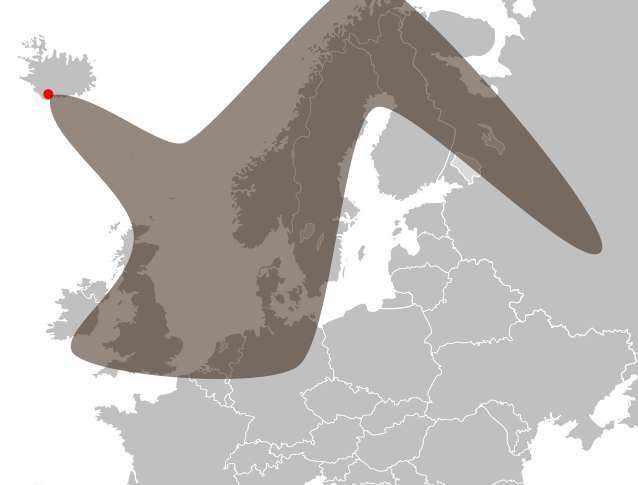 Plumes of cold ash would spew out from the ground for many hundreds of kilometers around. It would ruin crops and air traffic, resulting in isolation, health problems from the dust and food shortages. On top of this, the dust would be radioactive. 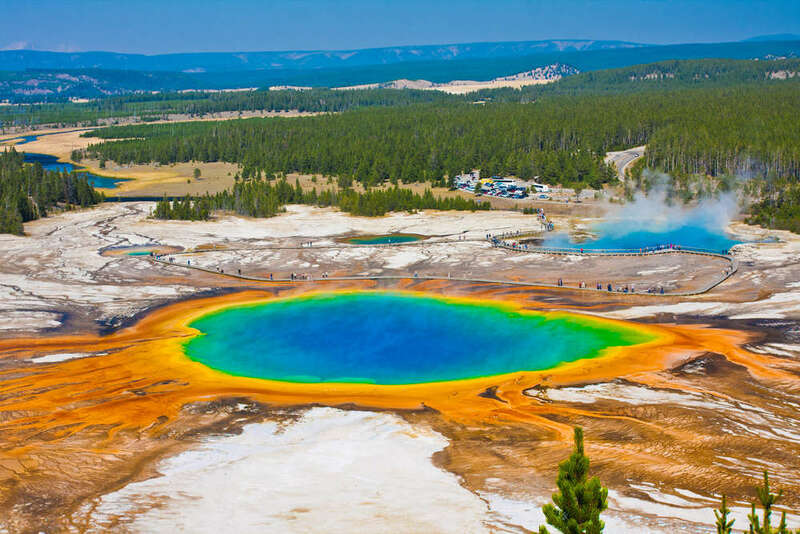 A prismatic spring in Yellowstone National Park. Lorcel/Shutterstock. Were Tsar bomba to explode in Yellowstone, then the closest you could be to the blast waves before you sustained an injury is around 160 kilometers (100 miles). This radius isn’t the apocalyptic destruction that one might expect. However, like Eyjafjallajökull, it’s the clouds of dust that could be swept all across America that would do the real damage.